How is it even possible to write negative words? In case you’re new here, let me explain my tracking sheet. Starting at row 10 is the list of all my works in progress and below that all my completed works, with word counts noted. That’s where I update my word counts to get an updated cumulative word count. The previous total number is manually adjusted each day so that the spreadsheet will calculate an accurate number of words for today. This lets me work on as many stories as I want in one day and still have a central place to track that word count. I’m sure some people would like to have individual spreadsheets for each book or story, but I really don’t want or need that much granular detail. I tried adding another step into my tracking process for a while, but keeping up with one more sheet was just too much of a time waster for me. Anyway, my point is that I have negative words because I obviously deleted more than I added, so at the end of the day my word count in the doc for my current book was lower than it was at the beginning of the day. 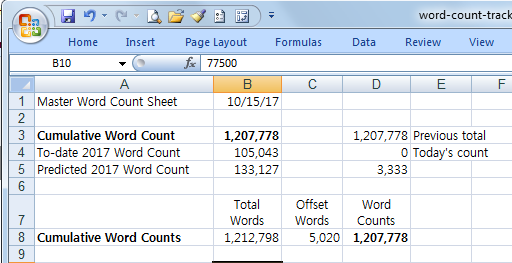 For my sheet to be accurate, I have to record my doc’s actual word count. I like it that way even if it does leave me in the hole some days. Sadly, -96 words is nowhere near the 1,500 word goal I set myself last night. I fell down hard on that. My only excuse is, well, an excuse. I’ll take a pass on making it. Next Next post: Why can’t I break the Kboards habit?